Hull-based food company William Jackson Food Group is investing £40 million in a second bakery to support growth in its subsidiary business Jacksons bakery. 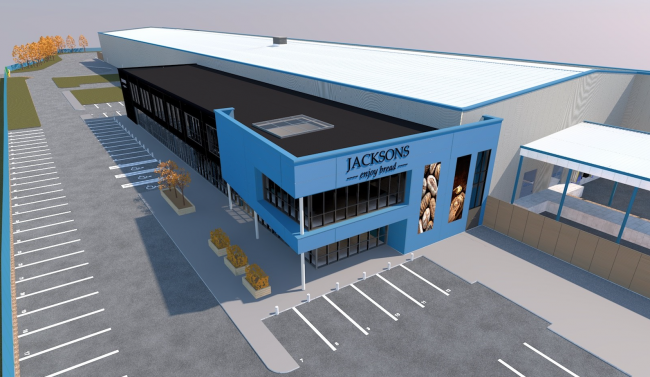 Corby Borough Council has approved plans for the new bakery, which will provide additional support to Jackson’s main bakery in Hull, making bread for sandwich manufacturing and food service customers, initially creating around 100 jobs. The new state-of-the-art bakery, designed specifically to make sandwich bread for sandwich manufacturers, will be built on a 10-acre site in Genner Road on the Willowbrook East Industrial Estate in Corby which was purchased by the business in February this year. Norman Soutar, CEO of William Jackson Food Group, said: “The Group and its family shareholders have invested significantly in the Hull bakery over recent years, and indeed continue to invest in the Hull site. We take a long-term approach to the individual businesses in the Group, allowing them time to grow and develop and we’re very much looking forward to seeing how the next chapter of the bakery’s life unfolds. Jacksons, which has baked bread on the same site in Hull since 1907, is part of the family-owned William Jackson Food Group, which also owns Aunt Bessie’s, Abel & Cole, MyFresh and The Food Doctor. In addition to making 70 per cent of the bread used in UK prepared sandwiches, the business makes branded bread for sale in UK supermarkets – Jackson’s Yorkshire’s Champion which has grown every year since its launch in 2012. The brand will continue to be produced at the Hull bakery, remaining true to its Yorkshire values.